There’s a story that I love to tell. So many of you have heard it before. But this is the night for telling stories over and over again and because I love this story, tonight’s the night! I first heard it from a very wise seminary professor and since then I’ve heard Marcus Borg and Parker Palmer tell it. I’m not sure that this story actually happened, but I am sure that it is absolutely true! It’s a story about a three-year-old girl who was the only child in her family. Her mom is pregnant, and this three-year-old girl is very excited about having a baby in the house. The day comes where the mother-to-be delivered, and the mom and dad go off to the hospital. A couple of days later they come home with a new baby brother. And the little girl is just delighted. But after they’ve been home for a couple of hours, the little girl tells her parents that she wants to be with the baby in the baby’s room, alone, with the door shut. She’s absolutely insistent about the door being shut. It kind of gives her folks the willies, you know? They know she’s a good little girl, but they’ve heard about sibling rivalry and their not sure about what they should do. Then they remember that they’ve recently installed an intercom system in preparation for the arrival of the new baby, and they realize that they can let their little girl do this, and if they hear the slightest weird thing happening, they can be in there in a flash. Tonight we are all that child, standing over the baby’s crib hoping against hope that the newborn baby will tell us about God; maybe because we have almost forgotten, maybe because we don’t believe, maybe because we want to believe, maybe because we’ve lost hope, maybe because we are endlessly curious, or maybe just because T’s the season! Regardless of why, here we are gazing into the crib at the newborn baby hoping that this child will tell us about God. But all we have is this story; a story so simple it sounds as if it was created for children; poor homeless refugees, far from home, in the darkness of a winter’s night, struggling to keep warm amongst the dung of a stable, a tiny baby, swaddled in what we imagine as rags and lying in a feed trough, shepherds, angels and a star in the night sky. It’s a lovely story. A story that warms our hearts, told over and over again in the darkness of so many winters as we struggle to keep our demons at bay. We’ve told it so often that we’ve forgotten why it was told in the first place. We’ve lugged so much of our own baggage into that stable that we can scarcely see the baby. We’ve heaped our expectations and longings onto the images and our need to know has demanded that the facts confirm our desires. So, the experts, the theologians, the historians, the archeologists, astronomers, astrologists, physicians and even the clergy have been conscripted to substantiate the facts. Tell us about God we demand. We’ve almost forgotten. Tell us that, there really was a star. Tell us that, a virgin can conceive. Tell us that, there was a census. Identify the wise guys. Integrate the shepherds Gather the evidence. Establish the facts. Tell us about God. We’ve almost forgotten and it’s cold, and its dark and we are sore afraid. We’ve almost forgotten why the stories were created in the first place. We’ve certainly forgotten who created them. We don’t know their names so we call them Matthew and Luke. We suspect that the stories did the rounds before they were finally written down some fifty or so years after Jesus of Nazareth walked the earth. We know that the stories are very different one from another. They simply don’t agree on the details. We know that there is no evidence that any of Jesus’ contemporaries knew these stories. The apostle Paul never mentioned them. The writer of the earliest Gospel, the one we call Mark, never mentions these stories, nor does the writer of the Fourth Gospel the one we call John. We only know that the details of these stories are very similar to the details of other ancient birth stories, like the ones that are told about Caesar Augustus, and Alexander the Great. Our efforts to historicize these stories have failed. Our habit of literalizing the details have deluded us and the truth their more-than-literal meaning reveals has eluded us. Our fear has almost caused us to forget the reality that these stories may not have happened exactly this way, but they are always happening this way. We’ve almost forgotten that the creators of these stories wrote them they way they wrote them for very particular reasons. They had a legacy to contend with; the legacy of a man who came along and changed everything. Jesus of Nazareth had turned their world upside down. Jesus had challenged and changed the rules. Every once in a long while, someone comes along who changes everything. In this ever-evolving creation in which we live, there are times when creatures take a giant leap in a new direction. Someone or something happens upon the scene and the evolution of our species is shaped for a new kind of development. Jesus was that kind of event. Jesus, or at the very least the mythology around Jesus, broadened the horizons of the people of the first century and moved a large section of the population toward a way of being in the world that began to break down tribal barriers, that called for a kind of peace that cannot be achieved at the edge of a sword; the kind of peace that comes only through justice. Jesus challenged the religious rules and regulations and opened people up to a way of connecting to the sacred that spilled over beyond the rules and regulations. Jesus embodied a way of being that not only rejected violence, by challenging people not to hate and beyond that not to even think about hating, or killing their enemies. Jesus challenged people not just to love the loveable, but to love your enemies. Jesus embodied a way of being that rejected greed, by challenging people not to steal, and beyond that, challenging people to not even desire the things that were not theirs, and to give; give until everyone’s needs are met. Jesus embodied a way of being that embraced the poor, the outsider, the despised, the marginalized, and even the foreigner. Jesus embodied a vision of the Divine One, as a God who will not be confined by the religious authorities; a God who dwells in us, with us, through, and beyond us. Jesus lived and moved in the religious traditions of his people and took them beyond the limitations of their visions of God, and opened them to possibilities so earth-shattering that his embodiment of the sacred threatened the status quo and frightened the religious and political establishment. So, they killed him. But Jesus’ embodiment of the sacred would not die in the hearts and minds of those whose lives had been opened to the possibilities of a new way of being in the world. In Jesus, the world saw the fullness of human possibility: to make God visible in our lives. In Jesus the world came to see the Ultimate Reality, the One we call God come to expression in human form. 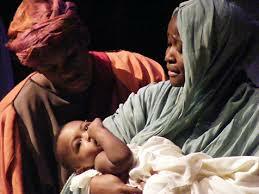 This is the legacy that the creators of the stories about Jesus birth wanted all the world to know about. So, they wrote it all down, so that the people would understand. They made the stories about his birth so simple that even children could understand them. They wrote them in the style of their time. They included details that would alert their listeners to the revolutionary nature of the life of this man who embodied the divine so fully, so completely and so radically different than anyone they had ever known. The radical nature of Jesus’ challenges caused a shift in our evolution as a species. Our vision has been forever expanded. Our hopes and dreams for justice, peace, compassion, and love were nourished and enlivened by the way in which Jesus embodied the sacred; the One who is the source and ground of our being; that which we call God. the kind of courage that puts love of neighbour, both friend and foe alike, above our own desires, above our greed, above our prejudices, and above our fears. In Jesus’ legacy we are called to a new way of being in the world a way of being that sees the sacred in the ordinary stuff of life; a way of being that cherishes creation, that is open to the possibilities of evolving into an even more gracious and loving human being, a way of being that is nourished, grounded and sustained in this life by the One who is the source of life, who lives and moves in with and through us. There have always been those who are willing to tell you exactly what God is like. You can hear them on the television, in the market-place, in the halls of academia, on the streets, from pulpits and soap-boxes, you can even hear them in your own homes and sometimes in your own minds. But tonight we are given an amazing, enlightening vision of God. Standing over the crib, gazing at the baby. Hoping against hope that the child will tell us about God, because we have almost forgotten. Here in the vision handed down to us from generation to generation we can see exactly what God is like. God is like every mother’s child, even a lowly, unwed mother’s child; even a poor homeless mother’s child. Our God looks like every mother’s child We need not forget about God, we need only to recognize the Spirit of God who lives in every child; every birth is sacred, every life is sacred, even yours, even mine, even the lives of those we have labeled as poor, homeless, despised, even the lives of those we call enemies are sacred. Our challenge, staring into the crib, gazing at the baby is to remember the God in whom we live and move and have our being. To remember and to live fully, love extravagantly and become all that we are created to be. This and this alone will quell the cries of all the babies, so that they can slumber in the peace of the One who, is, was and ever more shall be the Holy One, Emmanuel, God with us! This entry was posted in Adult Education, Evolutionary Christianity, Progressive Theology, SERMONS, STORIES, Theology and tagged Christmas story, emergent theology, emerging church, Evolutionary Christian Christmas sermon, evolutionary christianity, historical nativity, John Dominic Crossan, John Shelby Spong, Lutheran Christmas Day Sermon, Lutheran Christmas Eve Sermon, Lutheran sermon Luke 2:1-15, Marcus Borg, Parker Palmer, progressive Christian Christmas Eve sermon, Progressive Christian sermon Luke 2: 1-15, progressive christian spirituality, Progressive Christmas Day sermon, spirituality by Rev. Dawn Hutchings. Bookmark the permalink.